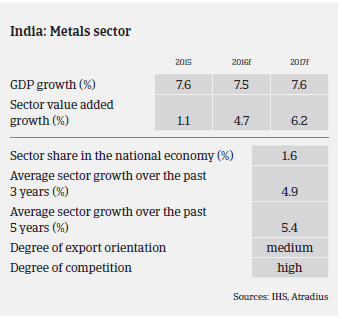 According to the Joint Plant Committee (a unit set up by the Indian Ministry of Steel), in the 2015-2016 fiscal year (in India the financial year runs from 1 April to 31 March) India's steel production decreased 1.9% year-on-year, to 90 million tonnes. That said, steel consumption increased 4.5%, to 80 million tonnes, driven by demand from the automotive and (road) construction sectors as well as increased public sector spending. Steel imports increased 25.7%, while exports decreased 27.1%. Imports of total finished steel products accounted for 15% of domestic steel consumption, in contrast to the average 10% rate in the previous five years. As in 2014, India was a net importer of finished steel. 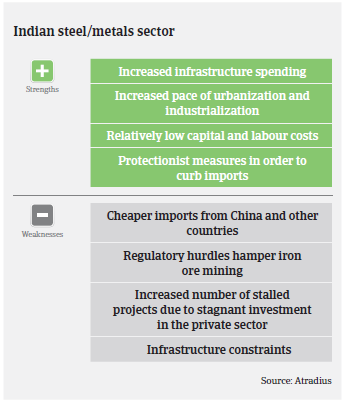 In order to stem rising imports and to protect domestic steel producers, the Indian government has implemented certain measures in 2015 and early 2016, such as increasing the steel import duty from 5% to 12.5%, fixing a Minimum Import Price (MIP) for steel ranging from USD 341 to USD 752 per tonne with effect from February 2016, and putting steel imports under Mandatory Bureau of Indian Standards (BIS) certification scheme. This resulted in a decrease of steel imports by 29% year-on-year in April-May 2016. The measures to stem cheap steel imports have been welcomed by the Indian steel industry, which has seen two years of sliding net sales, dropping profits and, in some cases, rising net losses and an erosion of net worth. Due to decreasing imports and rebounding sales prices, domestic steel producers are expected to increase sales volumes again. Domestic steel demand is expected to increase 6.3%-6.5% in the fiscal year 2016-2017, due to increased consumption by key end-user industries such as construction, capital goods and consumer durables. The government’s focus on infrastructure growth through initiatives such as Housing for All, the development of 100 smart cities (Smart Cities Mission), and the launch of a National Infrastructure Investment Fund is expected to spur demand in the construction sector. A benign inflationary environment along with lower interest rates is expected to support demand for capital goods and consumer durables. However, it is expected that the benefits from domestic demand growth will be offset by limits to raise sales prices due to the global steel overcapacity and cheap imports. At the same time, the share of stalled projects in the steel and metals industry has risen steadily since June 2015, to more than 12% at the end of March 2016. This was mainly due to the private sector where more than 20% of investments are stagnant. As a result, outstanding loans in the steel industry have increased, making the sector one of the largest contributors to non-performing assets (NPA) in India. Due to the high NPA level, banks remain reluctant to provide loans to the industry. 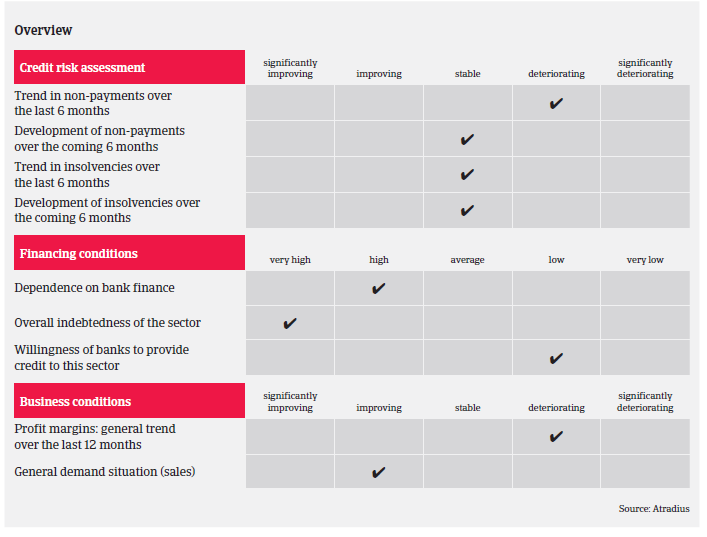 External financing at competitive conditions remains a challenge for many steel businesses. On average, payment periods in the Indian steel and metals industry have remained unchanged since last year, taking between 60 and 90 days. However, we also have monitored cases where payment terms have been extended, going up to 180 days. We have received just a few credit insurance claims in the last three years and, based on our experience to date, we do not plan any imminent major change in our underwriting approach as we do not expect any major increase in payment delays or insolvencies. Nevertheless, we remain prudent in underwriting this sector. We are maintaining a particularly cautious approach on steel traders and wholesalers. To accurately assess credit limit applications we always require up-to-date financial information and, more importantly, details of up-to-date trading experience with buyers in order to assess actual requirements and monitor any changes in payment behaviour. We also assess the strength of the customer/buyer relationship. As securities (in the form of guarantees to trade suppliers) are fairly unusual in India, we would tend to agree to partial decisions rather than require a security, which is hard or even impossible for the customer to obtain. If we are restrictive in our decisions, we always explain our areas of concern and what information we would need to reassess. We would generally not encourage customers to lengthen their normal terms of payment.